In every office you will find a procrastinator. They are generally the quiet souls in the corner who never get involved in group discussions, drag their feet when it comes to making decisions and would run a mile if a great opportunity landed in their lap rather than grab it with both hands. If everyone had this mindset we would still be writing with quills and be working in a place lit by gas mantles. These are the kind of people who have to step out of their comfort zone and perhaps the message you are sending them via these business ecards could be just the push they need. 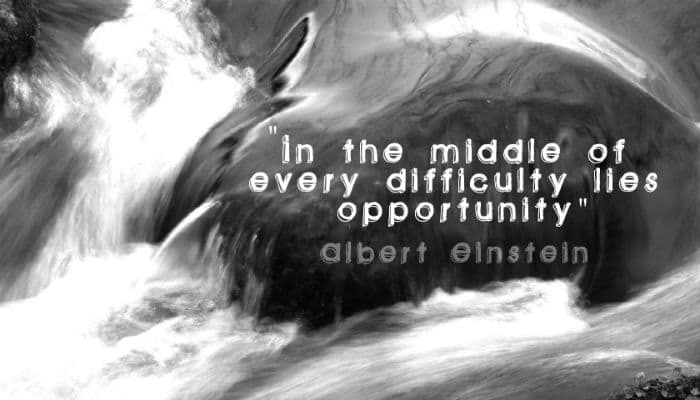 The monochrome image of a surging ocean serves as the backdrop for a quote from one of the greatest opportunity grabbers in history; Albert Einstein and it reads “in the middle of every difficulty lies opportunity”. Procrastinators tend to be lacking in self confidence so knowing somebody else believes in them can work wonders as this could be just the boost they need to finally grab life by the horns and start to live the life they want rather than the one determined by their frame of mind. Has your business considered yet how it will communicate its seasonal Christmas well wishes to clients. Take them out for a drink and send them one of our corporate Christmas ecards to tell them about it.